Senegal winger Sadio Mane gave a thumbs down to supporters telling his international teammate Kalidou Koulibaly to join Manchester United. The Lions of Teranga beat Equatorial Guinea 1-0 in an African Cup of Nations qualifying match on Monday night and after the game, Liverpool winger Mane sent a message to the away supporters. 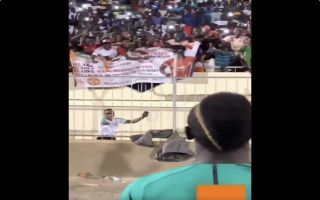 A section of Senegalese fans were holding up a banner which displayed an image of Napoli defender Koulibaly, with a caption urging him to secure a transfer to Old Trafford this summer. According to the Manchester United Evening News, Koulibaly is a primary transfer target for United, but Mane’s hilarious reaction to the sign indicates he is definitely not supporting the proposed move. The Liverpool superstar simply smiled and gave a thumbs down gesture as he approached his country’s fans, which sparked plenty of laughter in the stands. Check out a clip of the incident below, via Twitter. Sadio Mane’s reaction to a banner from Senegalese fans telling Kalidou Koulibaly to join Man Utd ?